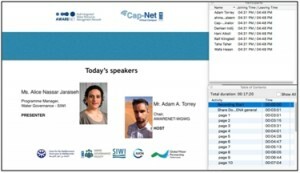 The first session of an E-learning series on "Water Integrity for Arab Countries" was held 23 February 2016 using the Cap-Net Virtual Campus. The series is jointly organized by AWARENET in cooperation with the UNDP Water Governance Facility at the Stockholm International Water Institute SIWI and Cap-Net UNDP. It is designed for professionals in the water and environmental sectors in Arab countries interested to learn about approaches to addresses the challenges related to water integrity. Participants of the first session included professors, engineers and consultants who accessed the learning platform from across the Middle East and North Africa and were able to engage in live discussions with the other attendees. The presenters were Adam Torrey from AWARENET and Alice Jaraiseh from SIWI. The second session took place on 3 May 2016 with Dr. Abdelrahman Tamimi from the Palestinian Hydrology Group as presenter. The third session will take place on 14 August 2015 with Dr. Muwaffaq Saqqar from Arab Fund for Social and Economic Development. For more information please contact: awarenet-unescwa@un.org , secretariat@awarenet.info .